This is the second in a series on best winter walks with children. AMC chapter trip leaders and staff have compiled lists of their favorite winter outings for families. We started in the White Mountains, with suggestions from AMC senior interpretive naturalist Nancy Ritger. Now we move to exploring winter with children in the suburbs around Boston. Eddy Luttmer “retired” from leading family trips for AMC’s Boston Chapter on the last day of 2009. Now that his children are older — his daughter is 22, his son is 18 — he’s looking forward to following their lead in the outdoors. He drew on his own parenting experience, as well as 14 years of leading family trips, for the following list of winter outings in and around Boston’s western suburbs. Mt. Misery, Lincoln. This close-in peak off Route 117 jumped immediately to Luttmer’s mind. “It has a nice network of trails,” he says, with great views of the Sudbury River. Walden State Park, Concord. “Obviously,” Luttmer says, Walden pond and the surrounding woods are a great natural retreat in any season, but for locals, some of the appeal of a winter visit is the absence of crowds. Henry David Thoreau wrote in Walden, “Every winter the liquid and trembling surface of the pond, which was so sensitive to every breath, and reflected every light and shadow, becomes solid to the depth of a foot or a foot and a half, ... and it is not to be distinguished from any level field. Like the marmots in the surrounding hills, it closes its eyelids and becomes dormant for three months or more.” Trails are open for snowshoeing and cross-country skiing, and also for simple rambling. Cat Rock Park, Weston. The downhill ski area that ran here for two decades starting in the 1950s left open slopes that make for accessible “back-country” skiing and snowshoeing only a few miles from downtown Boston. In spite of the name, the park has become known as a leash-free area for dogs. Cutler Park, Newton Highlands. In the summer, Luttmer and his children ride fat-tire bikes along the trails of this well-known green space right next to Interstate 95 (take the Kendrick Street exit). When there’s snow in the winter, those same trails make for great cross-country skiing. Auburndale Park, Newton. Luttmer recommends this park for families with younger children because of its combination of playground, walking paths along the Charles River, and small-scale nature walks. The next post explores southern Boston. After that, we learn about great places for families to go in the winter in the Delaware Valley and Connecticut. I hope you’ll share your own thoughts and ideas, too. 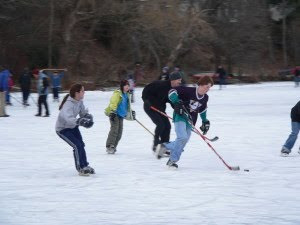 Photo credit: Pick-up hockey at Auburndale Park. Newton Conservators.